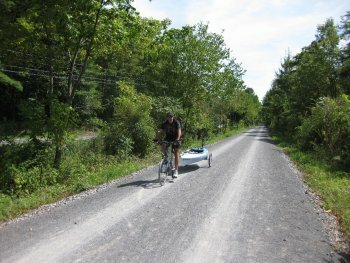 Caption: During the afternoon of Saturday, September 11, 2010, Greg Hudson, of Frederick, MD, bicycled from the Whitetail Parking Access of the Pine Creek Rail Trail just above Jersey Shore up to Bonnell Flat at Camp Kline just below Ramsey Village, pulling his kayak behind him. That morning he had driven roughly 175 miles from his home because he wanted "to check out the Pine Creek Rail Trail and the creek," which he had discovered on the Rails-to-Trails Conservancy website (railstotrails.org). At Bonnell Flat, Greg put his kayak into Pine Creek and, with his bicycle now mounted inside his kayak, paddled back down to the Torbert Canoe Access adjacent to Whitetail!